With a certainly different finish, this mannequin form will catch everyone's eye in your retail store. It is sleek and stylish and looks great anywhere it is put. 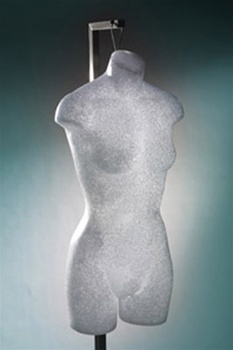 Female 3/4 Torso in Silver Female Dress Form with Wood-Like Flexible Arms and Hands - Choose your base Black Female Headless 3/4 Torso Display Form on Metal Stand Anita Brazilian Female Pant Form - Great Price!